Northern Railway Recruitment 2018: The Railway Recruitment Cell has announced 2600 vacancies available in northern railway for the post of Track Man. The application forms have been released and can be filled till 15-10-2018. 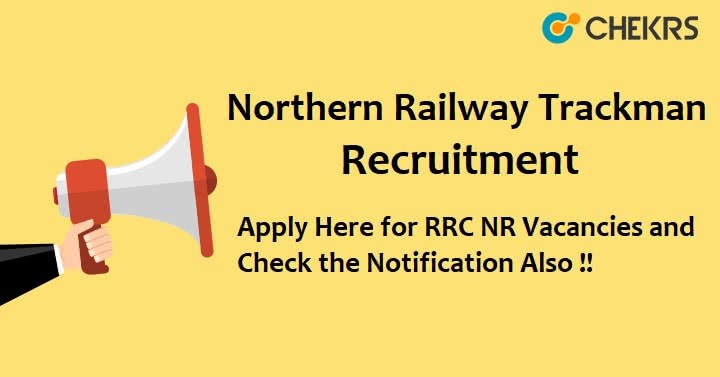 The RRC Northern Railway Vacancy Notification has been published on the official website and can be checked there. For more details regarding the available Railway Jobs such as eligibility criteria, selection process and salary etc read our article. Check out the notification carefully and confirm your eligibility before applying for the Northern Railway Track Man Vacancy. Also follow the given instructions to apply easily. Visit the official website of Northern Railways. Then, go to the Admin Login and enter the login details. Move ahead and click on the link for RRC Northern Railway Online Application Form given there. Attach the required documents and your photograph. Pay the application fee through given mode of payment. Post the form to the prescribed address. Remarks: Thanks for reading our blog about Northern Railway Recruitment 2018. Stay in touch with us and we will keep you updated about more govt. jobs. Also leave your related queries in the comment box.